1. Preheat the oven to 200°C, gas mark 6. Cook the potatoes in simmering water with the mint for 12 - 15 minutes until just tender, then drain and place in a shallow buttered gratin dish. Meanwhile, cook the asparagus in a large pan of boiling water for 4 - 5 minutes until almost tender. Drain and refresh under cold water then pat dry. Cut the spears in half. 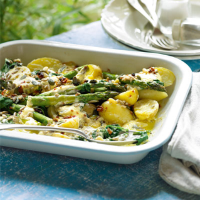 Blanch the spinach in boiling water for a minute, drain thoroughly and add to the potatoes with the asparagus. 2. Whisk the hollandaise and cream together and spoon over the vegetables to roughly cover. Scatter with the salad topper and bake for 15 minutes until the top is golden. Serve with crusty bread to mop up any extra sauce. This recipe was first published in April 2012.